This DVD is an official 'rockumentary' masterminded by Ozzy's son Jack, covering Ozzy's entire career to date in the form of new interviews, contributions from those in the know and archive footage and photos, interspersed with footage of what it's currently like for Ozzy on tour. 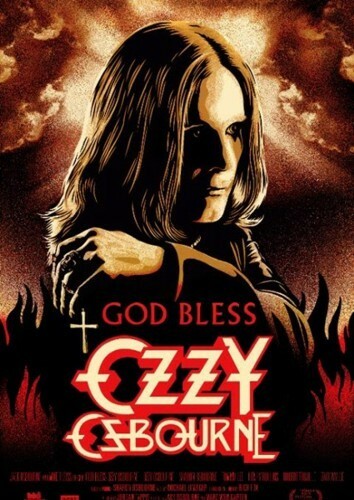 Ozzy is naturally entertaining and amusing and therefore I expected it to be an engaging documentary, and it is. More in depth than a lot of stuff I've seen, featuring a look at Ozzy's first marriage which bore two children (both all grown up but contributing accounts of what it was like having a demented young rock star as a dad), along with his first meeting of current wife Sharon. Bandmates Geezer Butler, Tony Iommi and Bill Ward are on hand to offer recollections of forming Black Sabbath and taking the rock world by storm. On top of that, musicians that have been influenced or affected by Sabbath's seminal work offer their thoughts, from the obvious (Henry Rollins, Robert Trujilo) to the understandable (Rudy Sarzo, Tommy Lee) to the just plain bizarre (Sir Paul McCartney). The Sabs are naturally all very candid about their massive rise to success, the drug use as a result of it, and the inevitable firing of an out of control Ozzy. Sharon then picks up the story of rebuilding Ozzy's career, which naturally brings up Randy Rhoads, who has his own say via archive footage, before the tragic story of his untimely death. Die hards may lament the skipping over of the bulk of Ozzy's post 'Diary Of A Madman' solo albums, which peters out with Ozzy watching his old promo videos, most of which he bemoans as lame or, better still, has no recollection at all of making! It offers a look at Ozzy returning to Birmingham with Sharon to visit the house where he grew up (imagine living there and having the Osbournes turn up and ask if they can come in!) while both Jack and Kelly offer their experiences of substance abuse, and even the normally camera shy and well-adjusted Aimee has her say. The documentary is also somewhat skewed in its perspective - naturally, Sabbath hiring Dio and continuing on is referred to simply as "they got another singer" and the success of Ozzy's early solo work is attributed solely to Randy Rhoad's playing and Ozzy's chemistry with him, whereas I remember Bob Daisley having a fair bit to do with the material. Other than the music, the film gives a grisly account of life as an addict, with stories from Sharon and Tommy Lee about Ozzy's behaviour being nothing short of disturbing. While entertaining, Ozzy is portrayed as a sad figure: still not very happy with his lot in life, although he has made great strides since being sober. He refers to himself as a "terminal perfectionist" and while some fans may feel he has latterly sold out, he still has a following and there's enough here to warrant any fan of Sabbath or Ozzy, young or old, seeing this.